Today’s review is a pretty quick one, very long overdue. 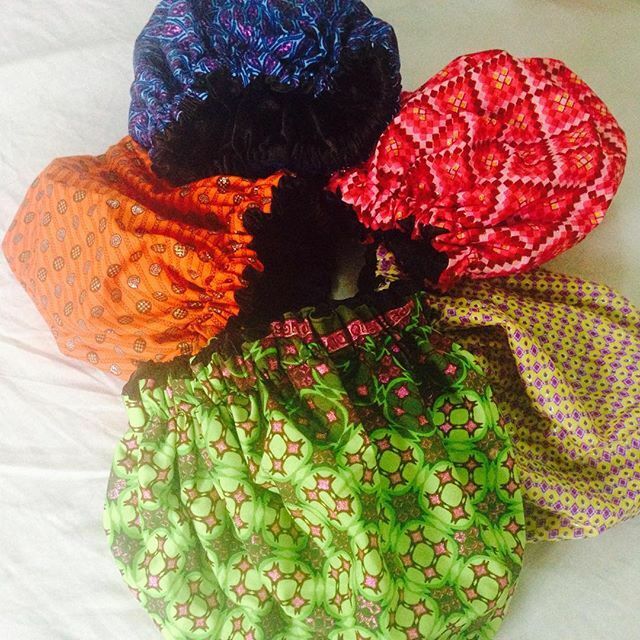 Elizabeth Cress is a Nigerian brand of handmade accessories, run by the lovely Funmi Kehinde. If you were at Naturals in the City, 12, you probably met her at my table. I’ve been reading Naija Hair Can Grow for almost as long as I’ve been on my healthy hair journey and it has been so good to see it grow- from blog, to the salon day outs, and then the hub! It’s time for another Salon Day Out and this one won’t be easy at all because Naija Hair Can Grow is 5! Its going to be a full day of activities with hair/beauty vendors setting up shop from 11AM at Oriental Hotel on Sunday the 7th of June. Entry is 500 Naira only, but- this gives you a redeemable voucher worth the same amount, that can be used at the Savvy & Chic Hair Beauty Hub Experience Booth! So basically, you can still get your money back. 2PM: The HAIR PROS SHOWCASE. Come watch Kemi Lewis of KL’s Naturals effortlessly create a natural updo, Dupe of Tasalahq fashion an edgy cut and color, Patrick of Patrick’s Beauty Zone create bouncy blow dried to perfection curls and the stylists at Savvy & Chic Hair Beauty Hub will be demonstrating their famed instant faux locs innovation ALL LIVE ON STAGE! 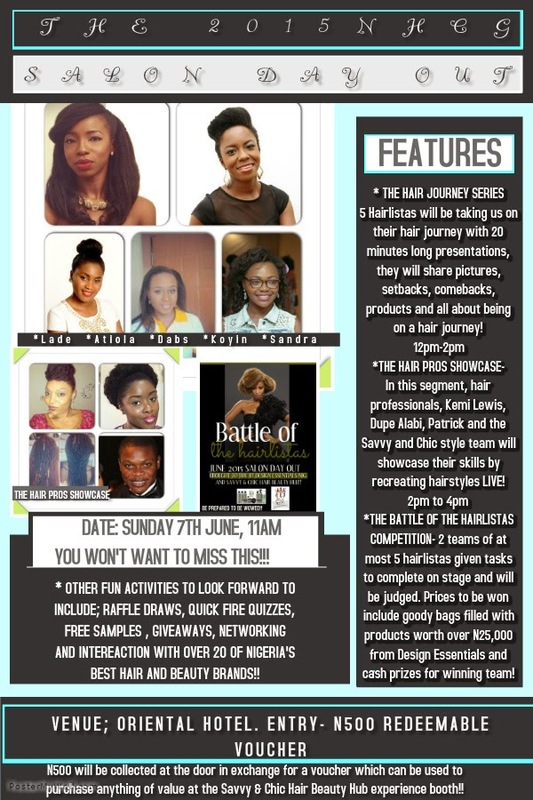 4PM: THE BATTLE OF THE HAIRLISTAS competition begins. 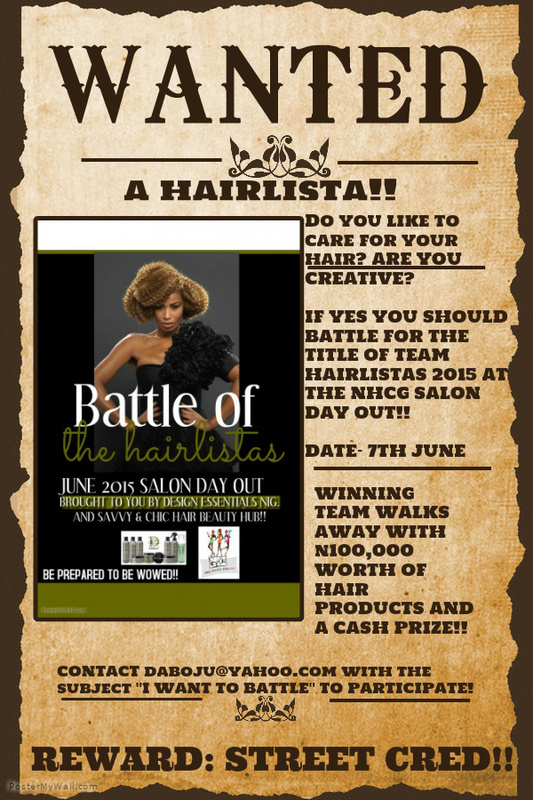 The members of the winning team stand to win over N25,000 worth of products (EACH) from Design Essentials and a cash prize from Savvy & Chic Hair Beauty Hub. No worries, the team that does not win will not go empty handed. Are you in Lagos? Are you good at caring for your hair? Are you creative with styling? 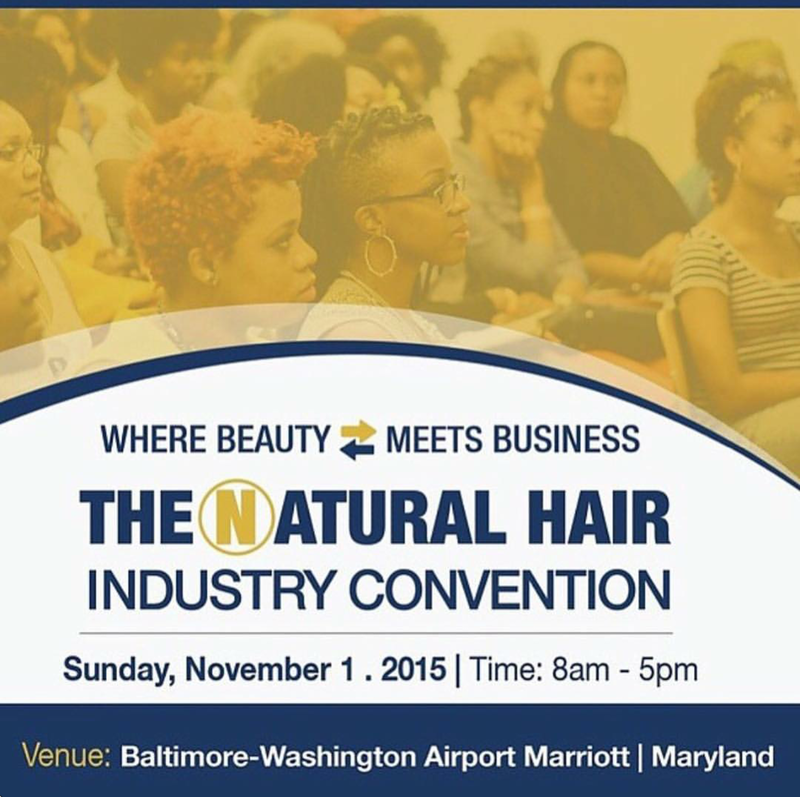 Natural or relaxed, doesn’t matter- you are a hairlista! To participate in the battle, email daboju@yahoo.com with the subject “I WANT TO BATTLE” by the 20th of May, latest. This is necessary so you can be properly grouped ahead of the competition! For further enquiries about this event, call: 08090613325. Whoop! I’m excited! Except the unexpected occurs, I’ll be there on June 7. Will you? 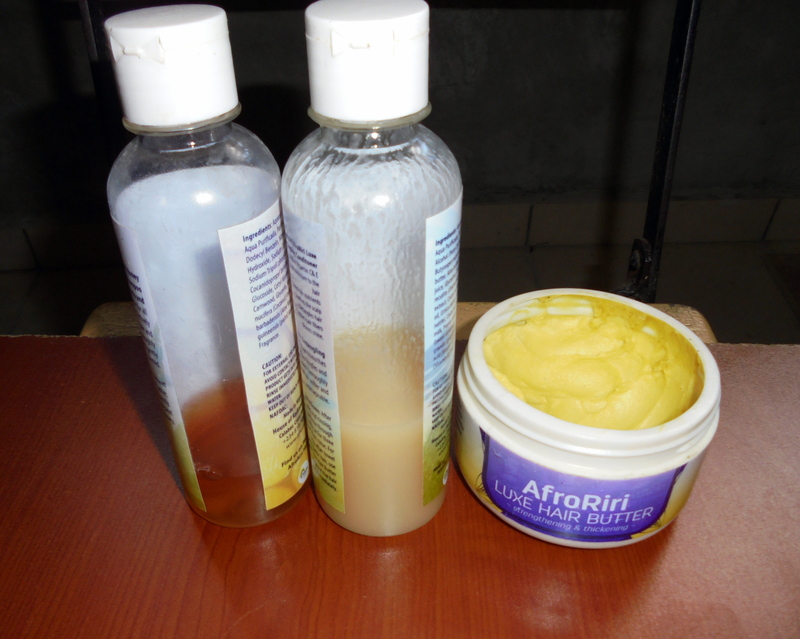 In August, I received three products from an indigenous company, AfroRiri Haircare. I got the Honey Moisturising Shampoo, Luxe Detangling Conditioner and the Luxe Hair Butter. I blogged about my First Impressions in this post. Its been almost two months now, and I’ve really got to use them, so here I am with my review. I have tightly coiled, ziggly 4C low-porosity hair. My individual strands are very fine and thin in texture, but they’re a lot, so I’m between medium-high density. I am not having any problems with my hair at the moment.